Launched the previous January alongside the Yamaha Tracer 900 GT, the 2019 Yamaha YZF-R25 now has official pricing from Hong Leong Yamaha Motor (HLYM) – RM19,998. 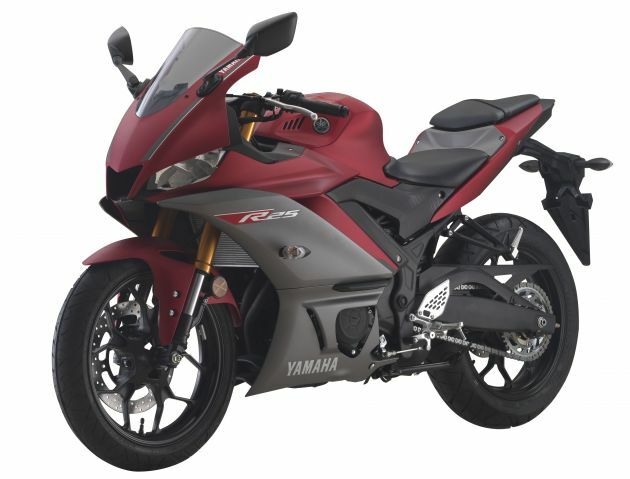 Expected to be in authorised Yamaha dealer showrooms next week, the YZF-R25 is priced sans road tax, insurance or registration and comes in red or blue, along with a 10,000 km or one year warranty, whichever comes first. Closely resembling the YZF-R1 superbike, the 2019 R25 comes with a redesigned fairing and better aerodynamics. According to Yamaha, during the global launch of the YZF-R25 last year in Jakarta, Indonesia, this is good for a 8 km/h increase in top speed. There is no change in the engine, with the YZF-R25 carrying the two-cylinder 249 cc, DOHC, liquid-cooled mill from the previous generation. Coupled with a six-speed gearbox, Yamaha says the YZF-R25 is capable of producing 35.5 hp at 12,000 rpm and 22.6 Nm of torque at 10,000 rpm. One of the biggest changes to the 2019 YZF-R25 is the inclusion of upside-down forks with gold-anodised fork tubes. At the back, the monoshock has been recalibrated for sporty performance and seat height is now 22 mm lower than the 780mm of the 2018 model. The tank on the R25 14-litres and has been reshaped for styling purposes, bringing it inline with Yamaha’s design language for its R-series sports motorcycles. LED lighting is found front and back on the R25 and the instrument panel is an LCD unit with shift light. Weighing in at 166 kg, braking is done with single discs on the front and back 17-inch wheels and ABS has been omitted for the Malaysia market. According to sources inside Yamaha, the current 2019 Yamaha YZF-R25 engine is powerful enough on its own and will not be coming with variable valve actuation (VVA). Quite a huge price increase from previous generation since it doesn’t come with road tax, insurance or registration fees. No abs n no vva, price before showroom rm19k. Reach aeon will be Rm25k. Malaysia baru? Still same black hole. Have Sport spec option? And when will movistar came? Please give me a date. Thanks. Typical. Still no ABS. We Malaysians are not concerned with our safety at all. Not even the manufacturer care about its driver safety. design looks very much like the R15. the price is also cheaper than Kawasaki ninja 250. this will be a good price point to compete with the ninja. the only plus point for the ninja is that it has ABS and it’s RM7K costlier than this R25. Seriously HLYM? Too comfortable selling Y15 and NVX yet bring in lousy spec R25? No ABS??? 2019! No VVA? what the…..sigh hong leong……do something about this. Are we Malaysian a joke to you Yamaha and hong leong?